Ribadeo is situated on the coast of the Bay of Biscay in Spain's northwest region of Galicia. Its history dates back to the Palaeolithic period with the remains of ancient settlements such as Louselas and Vilaselan. In fact the region's finest example of Iron Age precious metalwork is the Ribadeo Tiara. In 1183 King Fernando II signed a charter to allow the town to hold its own weekly market which made a huge difference to its economy. The town was originally formed around the docks of Porcillan and Cabanela along the banks of the river. The port of Porcillan dates back to the Roman era, and from here you can walk to the lighthouse of Pancha Island situated at the mouth of the estuary. Along the way you will pass the ruins of the Castle of San Damian, and there are also opportunities to go fishing or take boat rides along the estuary. The Eo River and tidal estuary are part of the Natura 2000 making it a specially protected area for birds as well as a Wetland of International Importance. By the 12th century most of the town's people were living in homes built around Vilavella Cove, and later two convents were established; the San Francisco and the Santa Clara. The Marquis of Sargadelos played a big part in promoting the town, and one of the most impressive buildings of that period is the Modernist country house of the Moreno brothers. The town’s historic quarter was declared a Site of Cultural and Historic Interest with many beautiful buildings such as Cedofeita, Ibanez, Quinta Longa, and Torre dos Moreno. During the 15th century Ribadeo was given to one of Henry II of Castile's knights, Pierre de Vaillaines, in return for his services. Known as the 'stutterer Villaine' he was General of the armies of the kings of Castile and lead them to victory on several occasions. Due to legacies and arranged marriages he managed to keep control of the region right up to the 19th century. Without a doubt one of Ribadeo's greatest attractions are the beaches. The most stunning one is As Catredrais with spectacular rock formations that form arches in the shape of a cathedral and can only be seen at low tide. In fact one of the beaches is actually called the Cathedral. This particular beach is only 3 miles from the lovely Parador Hotel Ribadeo. 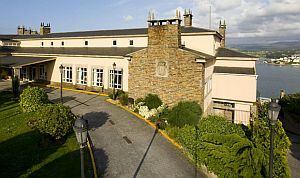 Once a large manor house, it has now been converted into a four star hotel with views over the estuary and the Galician countryside. This wonderful hotel also has its own restaurant specialising in international and vegetarian dishes. Das Illas is another beautiful white sandy beach, surrounded by cliffs and interesting rock formations in the water. The water is very clean and the beach has excellent facilities which include showers and beach volleyball - so it is very popular with the younger crowd. It is important though never to ignore the warnings about the tides in this area, as they can very swiftly cut you off from shore. Always check the times about when the tide will be high and low before heading down to the beach, and if there are no locals on the beach there is generally a very good reason! Other places of interest to explore is the Cargadeiro viewpoint, the marina, and Ribadeo's highest point which is Mondigo Peak. Or perhaps you might want to visit Rinlo which is a very pretty little fishing village only 5km from Ribadeo and also on route to Cathedral beach. A great way to get a marvellous view of the town's stately appearance is from the summit of Mount Santa Cruz. This is also where Ribadeo holds a pilgrimage on the first Sunday in August with a celebration of traditional music and local cuisine. So if you are trying to decide what time of year to come this event could be one of the highlights of your visit.